National Events Affect our Students: I have written year after year that I am NOT politically affiliated. I vote how I feel in each election (but I ALWAYS vote). Not being a Democrat or a Republican does not mean that I do not care about their policies and practices because they impact me as a person and impact the students and parents that we serve at school. Case in point. we spend a lot of time educating students about bullying, harassment, mental health, and doing the right thing. At the end of some weeks, and especially in January, we as administrators can be drained from helping students and parents work through highly stressful situations. We normally use the weekend to recharge, and we are right back at it. As news filtered out about President Trump's new approach to immigration, I saw the protests and anger that followed; I then realized just how much of a melting pot our District is when I heard from English as a second language and English as a new language teachers that some of their students were sad and upset that they may have to leave the country. These are completely documented immigrants and refugees, but I can understand their concerns, and it adds another layer of the support that we will be giving our students. These students have friends, maybe even your children, so please take an extra pause if they want to have a conversation about what is happening with the election and some of the policy changes that have been coming out of Washington, DC. It is really causing some children a lot of stress. Students Give Optimistic Speeches: The future of the nation is in good hands. 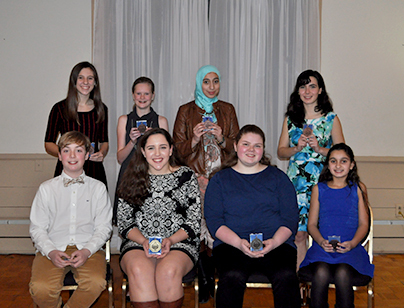 Last week, several of our students participated in the Camillus Optimists Oratorical contest and their speeches were uplifting and very motivating. The students represented themselves, their families, and West Genesee very well, and I am proud of each and every one of them. Click here for a list of participants and other details. Update on Smartbond Grant: Last April we applied for a grant called a Smartbond that has money available to increase the amount of technology that our students have access to. We heard from the reviewers last week and it looks like we are going to be approved shortly. This will allow us to purchase about 3,000 pieces of equipment for students to use in the form of iPads, Chromebooks, netbooks, laptops, etc. We have solid equipment now, but this grant will help us to get closer to having a device available for every student. Good stuff! Thanks for reading, stay warm this week, and I hope to see you at one of our events. I hope all of you enjoyed a weekend that felt like spring. I know I sure did, and I am sore from using muscles I haven't used since early fall. I am sure that Mother Nature has more in store for us this winter, but we should certainly enjoy the weather any time that we can when we live in Syracuse, New York! 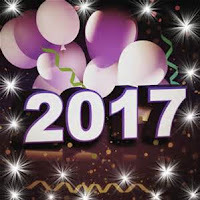 The Inauguration: The best rumor I heard all weekend was that I did not allow students to watch the Inauguration ceremony for President Trump. Could you imagine? Those who know me (and most of you reading should by now) know that I would never use my position to block a student, or adult for that matter, from experiencing history. We had to make sure that our Internet pipeline was as open as possible so anyone who wanted to stream it, could! I will admit that I was very worried about the potential for violence, and we did plan accordingly in the event of having to react to threats, violence, or disturbances; and we planned for this for either candidate because they were both so polarizing to the nation. Luckily, the transformation of power went without major incident, and we are all moving forward. Marching for Rights: On Saturday, hundreds of thousands of women rallied around the world to support equality, women's rights, and peace. One of those marchers was my sister, Sarah Patterson. I have written in the past that I am the oldest of three adopted children. My brother and sister are Native American; and I am not. 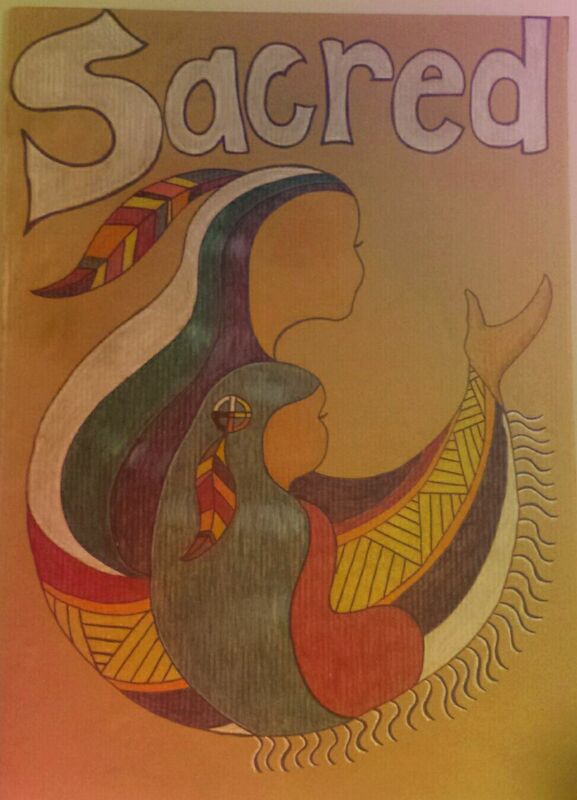 She is in the middle and I would describe her as part artist and part activist for Native American rights, but for the rights of women as well. She marched in Washington, DC with this piece of art that she made and it garnered a lot of attention from the media. As she left she was approached by a security guard from the National Museum of the American Indian who stated that her work would be considered for display in the museum as a part of the history of the day. Pretty cool, and I am proud of her. You can place your cursor over the picture to read her interpretation of her work. I am very thankful that everyone who went was able to rally in peace, and arrive home safely. Basketball Player Hits a Milestone: Congratulations goes out to senior boys basketball player Malik Zachery for scoring his 1,000th point last week against Fayetteville-Manlius. We will not get a chance to recognize him officially until our next home boys' game in about a week and a half, but I want to sincerely thank the FM Hornets for recognizing his accomplishment that night and on social media. That is true class. All-County Concert: Also a big congratulations to all of our Junior All-County Concert participants who performed at Solvay High School over the weekend. For a listing of those who participated click here. We really DO have talent within these four walls, and I invite you to check out the many performances that we are going to have this spring leading up to the fine arts Super Bowl that we call Kaleidoscope! Academic Decathlon season is upon us and our team started out with a strong performance. 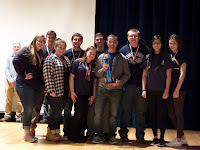 They came in second at the Section III competition this past weekend and will go on to compete at the state level in March. I am looking forward to another strong season from them. Swan Songs throughout Senior Year: There are only a few times in our lives when we get to do something for the last time. For some, like senior student and singer Caitlin Barry, those last experiences, or swan songs as we call them, will be on the biggest of stages. No pressure. 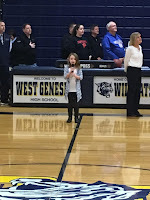 She began her farewell tour on Saturday at the Carrier Dome in front of over 20,000 people singing a perfect National Anthem. Boom. She commanded the challenging song with ease and punch and was rewarded by a loud ovation from the crowd. Crouse Hospital featured her life story in a touching article that can be found here and there is another story about her on syracuse.com here. She is destined to do great things with her gift, but more importantly she is someone who younger students can look up to and learn something from. Kaleidoscope isn't until May, but it should be on your calendar as something not to miss if you want to see a talented person "before she made it big". 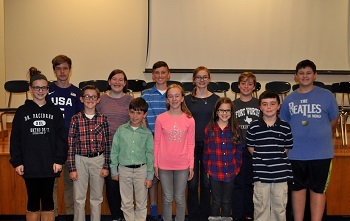 Spellers Advance to Next Level: The title of the blog this week also speaks to how well students involved in the The Post-Standard/WCNY Spelling Bee handle themselves. I would guess that most of you reading this have been involved in a spelling bee at some point in your life so you know what it looks and feels like. Now imagine advancing to the next level with more and more on the line, and fewer and fewer competitors to outlast. Ava Propper and Emily Pattermann from West Genesee Middle School, along with Laura Alvaro from Camillus Middle School, have done just that, and we wish them well as they advance into public competition on February 11 starting at 2:00 p.m. live on WCNY. If you are fortunate to be one of their parents and you are reading this, RELAX and enjoy the moment; trust me, and good luck to them! Great Question on Class Rank: Thanks to all who attended our "Dialogue with the Superintendent" sponsored by the West Genesee PTA/PTO District Council. It was very well attended, and I got some great questions. One of particular interest because it is a hot topic around the country had to do with class rank and whether we would consider moving away from class rank as other equally successful schools have done. National research shows that more colleges are considering the total body of work for students rather than where they rank in their class. For students, studies have shown that moving away from class rank creates a more collaborative environment for students and more students will challenge higher level courses because the result will not impact their rank. In schools like ours, the separation between the tenth student in the class and the fifteenth can be one hundredth of a point. I do not make decisions in a vacuum, but I am very interested in this topic. If there is interest in our strategic planning sessions to advance the topic, I will certainly keep you posted. 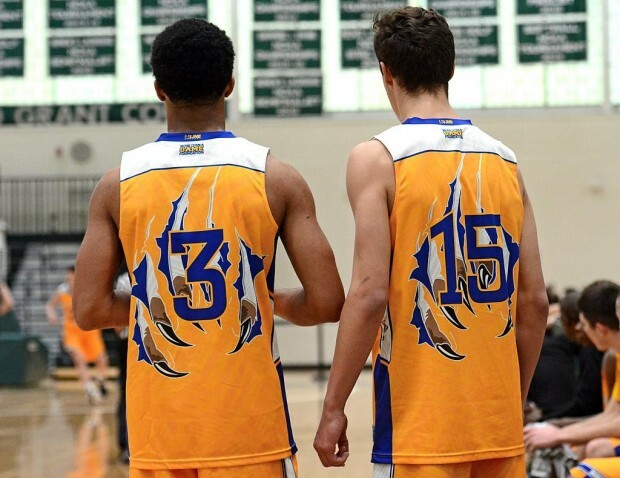 Boys Basketball Team Still Undefeated: On Saturday, our boys basketball team continued their undefeated streak. Whenever a team is undefeated this deep into a season you have to look back to the root cause. People can argue that coaching and talent are the key factors, and there is truth to that. I always look at two other things: the depth of the score sheets to see how many players are contributing, and how the students put in front of the microphone at the end of the game handle themselves. Right now, the boys are as tight as I have seen a team in a long time. They share the ball and the spotlight, and each young man who gets interviewed never talks about themselves. They spend the time talking about coaches and teammates who are working together to make things happen. Best of luck to them! 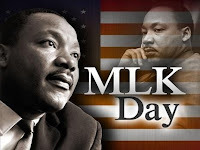 Celebrating Martin Luther King Jr.: We had yesterday off to recognize the impact that Dr. Martin Luther King Jr. had on our lives. I am most respectful of what he did because he was able to completely change the path of the nation regarding acceptance of all people, without violence. During my building visits last week I was really proud to see the work of Dr. King being celebrated and understood from kindergarten on up. I finally had a chance to catch a movie at the new Movie Tavern in Township 5. What a great place! I have never been to a theater where you can recline AND order food to your seat. Pretty cool. The movie, Hidden Figures, was even better and I highly recommend it! 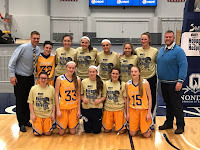 Sports and Art Come Together: On Friday, our girls basketball team played against Baldwinsville at home for first place in the section. 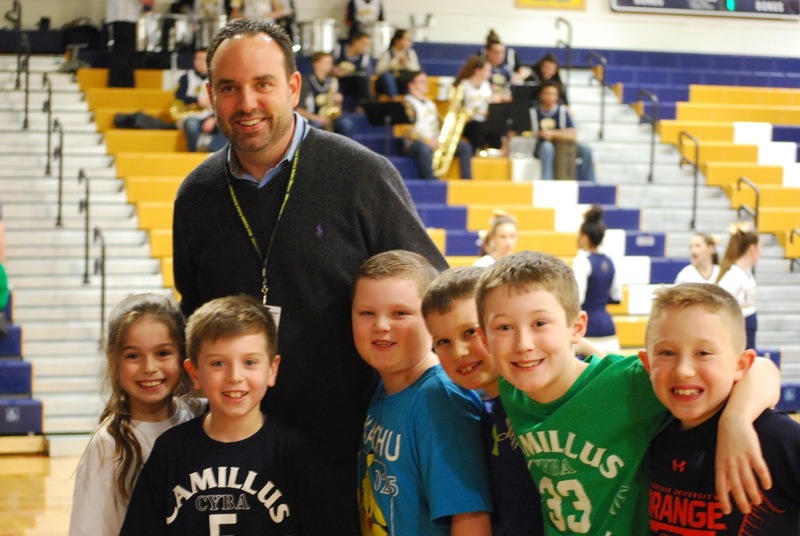 Halftime was set to be girls Camillus Youth Basketball Association (CYBA) games. There was a large crowd on hand for both. As the JV game ended (with a convincing win by our girls), I spent some time talking to parents, giving the pep band a pep talk, speaking to the cheerleaders, and preparing to find my seat for the varsity game. 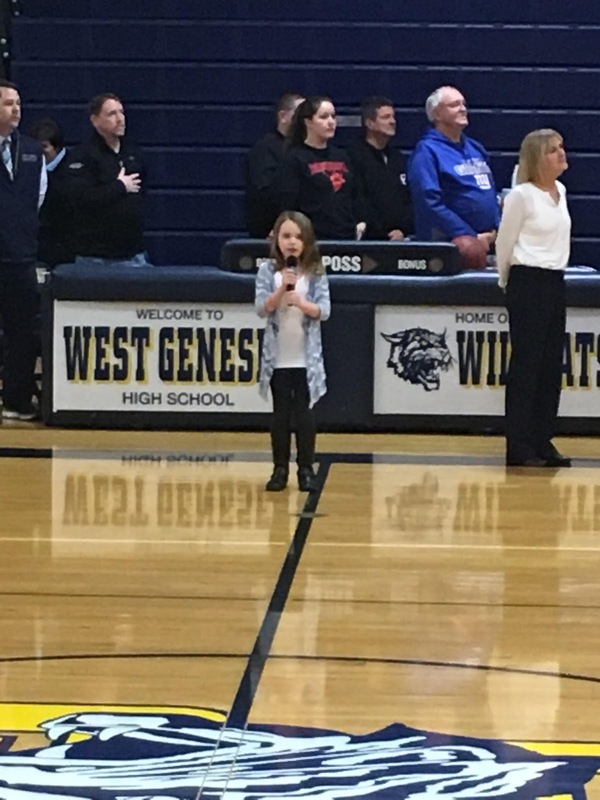 It was then that we were asked to rise for the National Anthem and THIRD GRADER, Taylor MacCaull, grabbed the microphone and stepped out toward mid-court. In front of her classmates, students, parents, and community members she NAILED it. What courage and poise! Everyone was so happy for her. A few moments later, parent Mr. Mercer snapped this picture, which completely sums up why I do my job; and why, after seventeen years this month, being a superintendent is still the best job on earth. Checking Your Sources: Fake news seems to be the topic of conversation around the country of late, and we have been talking about ways to help students separate fact from fiction when they read something either in print, watch it on television, or see it on the Internet. Our assistant superintendent found a cool link that reveals a one page checklist for fake news detection. If you are looking for some dinnertime conversation, click here for that good resource. 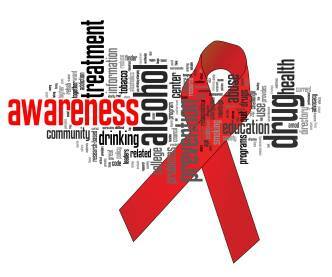 Update from Community Coalition on Substance Abuse: On behalf of our substance abuse coalition, I would like to thank ACR Health and the Camillus Police Department for their help in operating our recent NARCAN training. About 120 people received the training. We will offer another one at some point in the future. At this point, please place February 27 on your calendar as a night to come to school for a targeted resource night. Channel 9's Christie Casciano is going to be our keynote speaker, and we have some of the top physicians and speakers in the area to spend the night with us. Stay tuned for the full agenda. Questions for the Superintendent? : This Wednesday from 7:00-9:00 p.m. is our annual Dialogue with the Superintendent, sponsored by the West Genesee PTA/PTO District Council. The event is held at West Genesee High School in the Large Group Instruction Room. The format is fantastic. I give a quick "State of the District" and then attendees can write questions anonymously on index cards. The index cards are shuffled, and then I read and respond to them sight unseen. Looking forward to seeing you this week. Happy New Year and Welcome to 2017! If you are the parent of a senior, this means that we are only five months away from the "big day"; and time will fly by; believe me. I was fortunate to be able to ring in the New Year with friends at the newly refurbished Hotel Syracuse, and what a spectacle it was. We ran into three of our graduates who work there in upper level roles and it was great to catch up with them too. For many, the start of the new year means resolutions, or a time to do things differently. Not for me. I have been trying to lose ten pounds since October and the start of the new year isn't going to help that along. Really tightening my diet and getting in even more exercise will make the difference. On Target: On the school front, we plan to stay the course through the rest of the school year. We are looking good to exceed our academic goals for the year, and we are riding a wave of great morale all around. Our biggest challenges for January and February will be to mentally weather (no pun intended) the darkest part of the winter, and to build the 2017-2018 budget. We will. 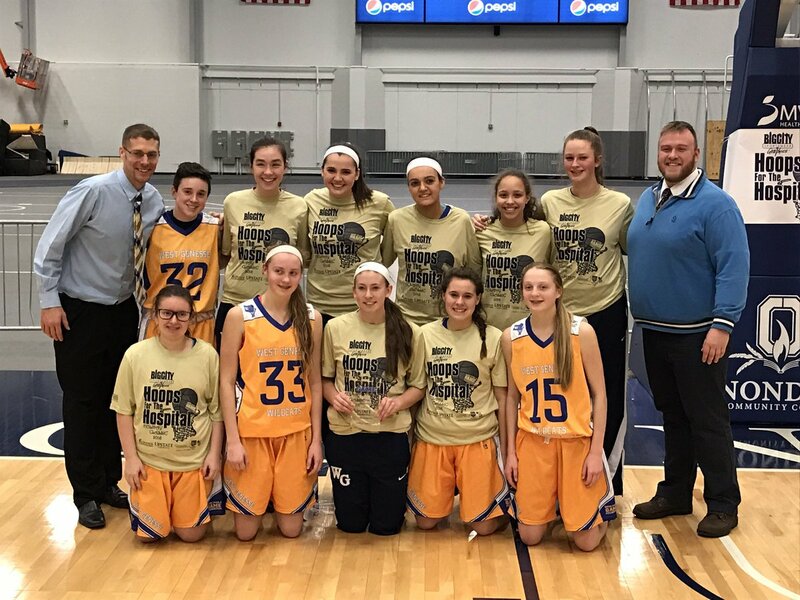 Sports Update: The weather prevented some games from happening over break, BUT the girls basketball team got a monkey off my back by beating CNS right before the holiday, and then went on to win the More Than a Game Basketball Tournament. Thanks to the girls, there are only two sports monkeys left in my nine years and counting at West Genesee. The first is for girls volleyball to beat Baldwinsville, and the second is for our boys basketball team to beat Bishop Ludden. That will happen! Free NARCAN Training: Please remember that the Camillus Community Coalition on Substance Abuse, in conjunction with the Camillus Police Department and ACR Health, is offering FREE NARCAN training this Thursday from 4:00 p.m.-9:00 p.m.(in one hour sessions) at West Genesee High School in the Large Group Instruction area at the rear of the high school. There is no pre-registration. Just show up for the hour that works for your schedule, get trained, and receive your voucher for a free NARCAN kit. Buckle up and here we go!